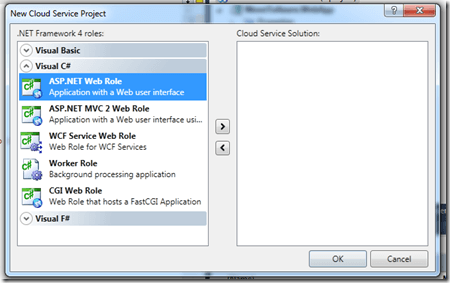 The Windows Azure platform exists for a long time till now but I never had the chance to migrate an established Web application to Azure. I try to document this step by step. 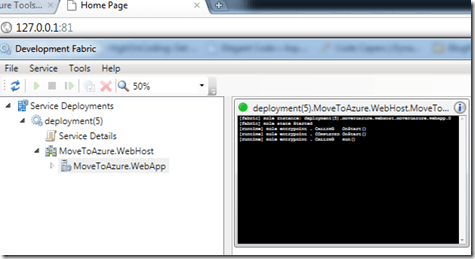 The first step is really easy: build a WebApp package and enter SQLAzure (the easiest way). 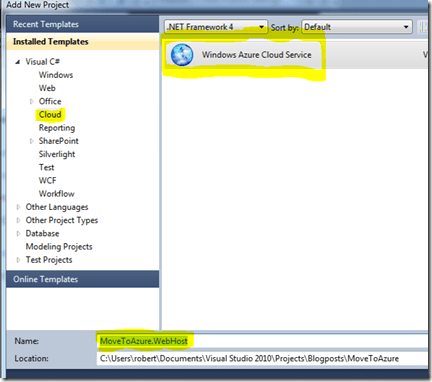 Of course you need the latest version of Windows Azure SDK (I´m use the June 2010 Version - is this the latest? ) Also you need an SQL Management Studio Express and if you installed a bigger SQL Server on your computer than you might read this. 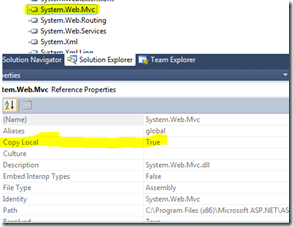 We have a standard MVC App without any references to azure assemblies. Therefore we have our file bank on the SQL Server. But I´m going to talk about the SQL Server later. 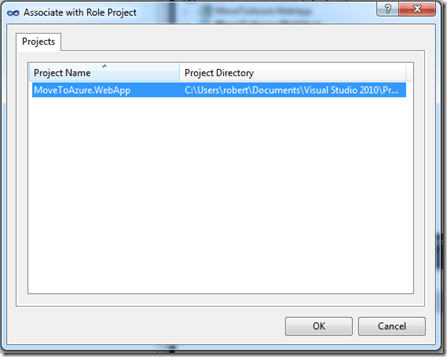 In the following window it´s possible to create a new project but in our case we already have a WebApp. So just click on "ok". 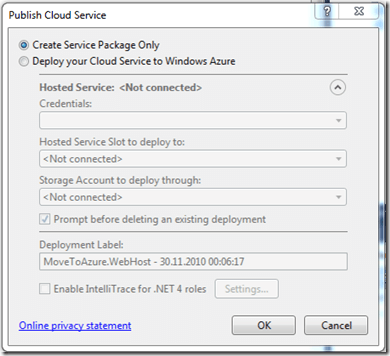 For the logs in the local environment a config entry will be created in the cloud config. This one have to be deleted before the Deployment. Both "ConfigurationSettings" are empty. Otherwise our project won´t run in the Cloud. 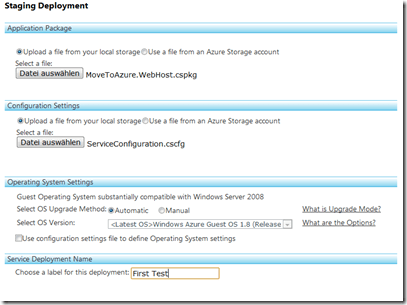 Those of you who are using an SQL file base and want to change to SQL Azure should read the second part first because after deployment you won´t be able to access the web.config. Here you need to apply the WebApp a little to reach thinks like this a little bit easier. IMPORTANT: the configuration of the build act should be on release. 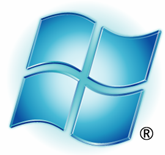 Create a new server on http://windows.azure.com. 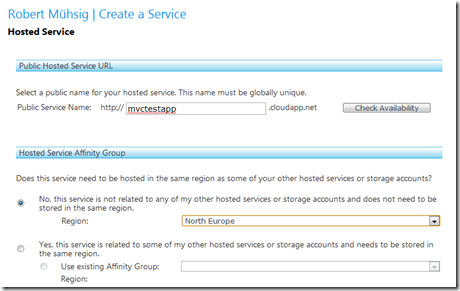 Now chose a "Hosted Service. " The other alternative is just disk space for tables, queues and blobs. At this point this is not interesting for us. In this screen you choose a name and eventually a description for the service. At this point you need to be careful. If you start slowly than you need to beware that, for example, the SQLAzure Instance is situated in the same region like the WebApp. At least you choose a domain for the service. After the upload you need to click on "run". Now it will take a few minutes until Microsoft saved the WebApp. 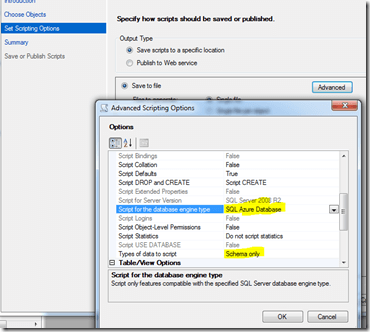 If you use a MS SQL data base you will be able to have a SQL Azure data base. Here the connectionString is shown and you can use it for example in the SQL Management Studio and connect to the data base. For safety reasons you need to enter you IP address. 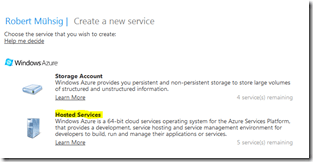 Afterwards you pass the SQL to the SQL Azure via Management Studio and that´s it.